This classic natural wood based concepts stay close to the natural shade of wood with most cabinet doors in the same finish with handles. Kitchen concepts are often in extreme light or dark tone, but this one begs to differ. 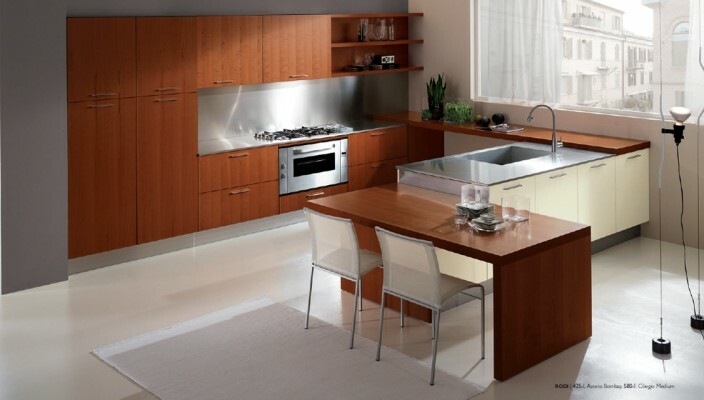 With most of the design in almost natural wood shade, the design features wall and base cabinets that come with handles. The additional small table has been added with two white chairs for dining. The countertop comes in a steel finish with one part of base unit in white. Ideal for small homes where space is a constraint and natural shades rule!